Okay, so I really liked this book. It’s a massively different beast than American Gods, but at the same time, it very much feels like it’s a part of that universe. Anansi Boys is on a much smaller scale than American Gods was. 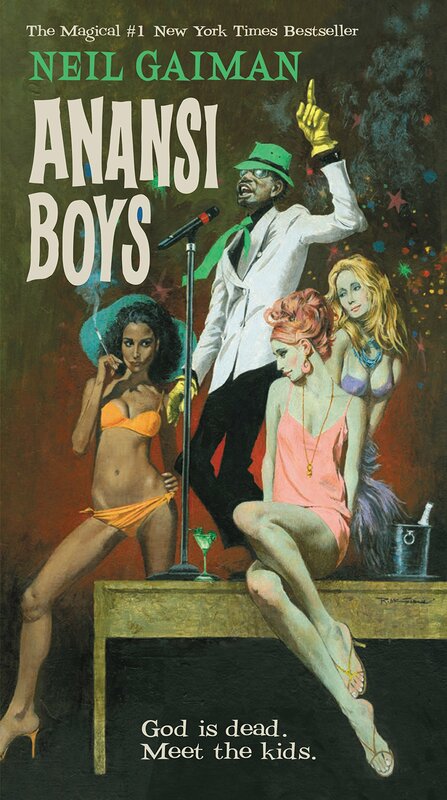 While American Gods dealt with gods fighting against each other, Anansi Boys is an extremely personal story about the children of a god (Mr. Nancy, Anansi) connecting with each other and coming into their own. That’s not to say that there’s not a lot of cool stuff that happens in this story. Especially as the novel goes on, the fantastical elements increase. Like American Gods, it’s very grounded in reality, but when something fantastic happens, it’s pretty unmistakeable. I loved the concept of Anansi (and, later, his children) being able to sing things into existence. I know that part of the lore of Anansi as a god is that he’s a storyteller, and I feel like that aspect was utilized really well in the book. In terms of pacing, it follows the pattern most of Gaiman’s books follow: they start off slow, setting everything up, and as they reach the climax of the story, everything quickens and coalesces into this unstoppable freight train of compelling reading. I literally read half the book in one sitting. (The second half of the book, for anyone curious.) This definitely isn’t a bad thing. I appreciate that Gaiman takes the time to properly set up his characters, plots, and universe that his works take place in. It allows him to ultimately craft a much more satisfying experience in the end than he would if the book just jumped straight into the action. That being said, sometimes it can take a bit of time to get through the part of the book that lays down the foundations and get to where all the fun stuff happens. But it’s a worthwhile effort. I also really liked how the relationship between Fat Charlie and Spider was depicted. It’s such an interesting dynamic that Gaiman gives them, and it makes the book more interesting for it. At first, it feels like things are gonna get into that cliche that stories dealing with brothers often get into (one brother steals the other’s girl, is generally better, etc) and while that does kind of happen at first, it ends up leading to a more satisfying conclusion than most stories that use this cliche do. The ending of the book justifies the initial use of that cliche, as Gaiman uses it as a way to have the two characters explore themselves and who they are. It’s used with mastery. I feel like it took me far too long to figure out the central mystery of the novel, but when I did, I ate it up. While the meat of Anansi Boys is the relationship between Fat Charlie and Spider and their feelings toward their father, Mr. Nancy, the addition of the thriller aspects of the plotline keep you invested in the character building. It’s like a character discovers something new about themselves that leads into an update in the central mystery/plot which leads into another character moment and so on and so forth. It’s great reading. All in all, I liked Anansi Boys a lot more than I thought I would. It’s clever, funny, moving, personal, fantastical, and just all around enjoyable. I highly recommend it for anyone who enjoyed the first American Gods book, anyone with an interested in African religions and mythology, anyone who enjoys Neil Gaiman’s books, or anyone who likes a good mystery with fantastical elements. Anansi Boys is an all around good time.